The most important question about this type of architecture is probably when should we use it and why? I invite you to have a look at this other blog post that goes over that - Angular Service Layers: Redux, RxJs and Ngrx Store - When to Use a Store And Why ? If you are getting started with Observables and Angular, you might want to have a look at this post where we go over some common trouble scenarios. One of the biggest design changes that happened since we started building single page apps is that the state of the app is now completely on the client instead of the server. The application state resides in the browser and is easily accessible for modification by any part of the app. The problem is that once the code gets larger and the team increases, this easy access to the application state starts to cause issues. Allowing the state to be mutated from anywhere in the app at any time quickly gets out of hand. Bugs and subtle race conditions start creeping in, and its hard to refactor without unexpected side effects. Global UI State: This state defines the way the user configured the UI: which language is active, which charts are visible, etc. Different strategies might be needed for controlling different types of state. Let's see how the Flux Architecture can help with that. Flux is an architecture for building frontends that originally came from the React community. The main idea of Flux is that the state of the application can be controlled by keeping it inside a data store. The View is simply your Angular component tree, meaning all the widgets that make up your app. In Flux the view is a tree of pure components that each act as a pure function: data comes in and gets rendered, but not modified directly by the View itself. The fundamental notion of Flux is the Store, which is the container for the application state. The state exists inside the Store and cannot be modified directly by the View. In Flux several stores can exist per application, for example one store for the contents of a data grid and one store for form data. But to make things simple let's consider that there is only one store. it is essential that the data coming out of the store is immutable. If the data inside the store is immutable, then how can it be modified? In Flux the only way to modify data is to dispatch an Action, that will trigger the creation of a new state. So the state never gets mutated, but a new version of it is created and used in place of the previous state. An action is just a simple message object, that reports something that has happened: data loaded, Todo added, list sorted, etc. The action also contains all information needed to create the new state of the store, such as: the new Todo added, the new sort order, etc. The Dispatcher reports actions to any stores interested in receiving it. Several parts of the app (and so several stores) could act on a given action. For example in an email app the folder list might want to update a counter if an email is received, but the main panel might want to display the new email subject in a list. Notice that the app state is logged in the console. This is a functionality of the first library we are going to introduce to build the app: Redux. Redux is a state container for building Flux apps. It follows a particular interpretation of Flux where the application only has a single store, and so no dispatchers are needed. But the ability for different parts of the application to react differently to an action is still kept in Redux, as we will see. The execution of actions can be wrapped in pluggable middleware such as redux-logger, which is used to produce the logging on the screenshot above. These methods are used only to create an Action, not to dispatch it. As we can see the Action is only a simple POJO with a type string property that identifies the type of action. The action object contains any information necessary to carry out the action, like the new Todo. Given an initial state and an action, the reducer function returns the next state. Reducers are pure functions with no side effects and don't mutate the input arguments. They are simple to test and to understand. The reducer just branches the calculation of the new state and delegates it to other functions, or calculates the new state directly in the switch statement if that only takes a couple of lines. This creates one reducer that delegates the processing of part of the state to two smaller reducers. Here we pass in the todoApp combined reducer, and the initial state. The logger middleware is added as well, so the Redux store is now ready to use. But how to we use it in an Angular application? The store will be needed in multiple places of the application. Any component that needs to dispatch an action will need access to the store. There are no real benefits for storing state inside a store using Redux if we cannot make the state immutable in a practical way. This means that we need to find a convenient way to both make the state immutable and to be able to create new versions of the state from the previous version without a lot of boilerplate. This library is the missing piece needed for being able to build Flux applications in Angular. Let's see how it works. The list can be iterated over using for ... of in an Angular template, as it implements the Iterable interface. The API is at the same time very familiar but quite different, because none of the familiar methods mutate the list. Not even push! What happens if we call push trying to insert a new element in the list? The return value of push is a new list containing the new Todo, but the original list remains unmodified. Internally Immutable.js has efficiently created a new collection based on the first collection, without deep copying the data. This is done in a completely transparent way, and makes it simple to handle immutable collections. The API of Immutable.js allows to easily obtain modified versions of deeply nested structures, which is exactly what we need to implement our reducer functions. Immutable.js makes immutability practical because it makes it easy to obtain a new version of the immutable data based on the current version. This syntax is not ideal, it would be ideal to be able to access the description using todo.description. More on this later. 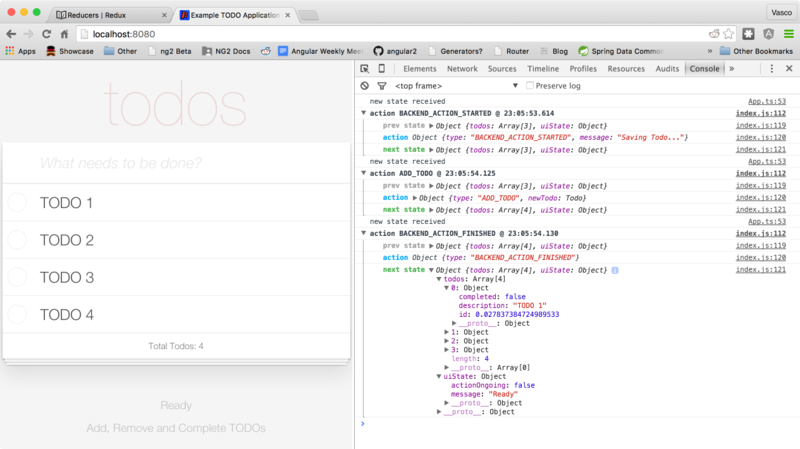 The description of newTodo will then be NEW TODO. An immutable Map can take any property as key, just like a POJO. With Map we won't be able to write type-safe programs, as it's a very generic data structure. This creates a new Record where two of the keys values (id and description) where specified, while the completed property takes its default value of false. If we try to set a property other than the 3 known properties we get an error. This prints TODO 1 as expected. This is already a good start, but it's still not type safe. There is an allowed set of keys with known types, but the Typescript compiler does not know about this, only Immutable.js has this information. Let's see if its possible to improve this. What we did here is we added the properties to the class. This way the Typescript compiler can auto-complete these properties, type check them and IDEs can refactor them and find usages. The todo variable is strongly typed, immutable and its properties are accessible with the same convenience as object properties. A whole ecosystem is in place for building solid Flux apps in Angular. A state container is available (Redux) with solid principles and plugins, great documentation and community momentum behind it. Altough Redux core itself is very intuitive, once we start adding some of the plugins like redux-thunk or redux-promise, the complexity starts to increase. Take a look at the real-world example in the Redux repository to have an idea what a real app will look like. Besides Redux, an immutable collections library exists (Immutable.js from Facebook) that can be used in a practical way to perform deep transformations of large object trees, and still do it in a type safe way. Angular will come bundled with Rxjs, which is also a promising library to help structure our app. See this post Angular Application Architecture - Building apps with RxJs and Functional Reactive Programming (vs Redux) for an example of how to build the same Angular application as in the sample repository but using RxJs. Have a look at this other post How to build Angular apps using Observable Data Services - Pitfalls to avoid for another aproach on how to build applications. It's still early to know what an Angular app will look like, but using Flux is a viable option: its a proven architecture that is known to have been successfully used to build some very complex apps (like Facebook itself). Want to Get Started With Angular ? Looking for other Angular Learning Resources ? Angular ngFor - Learn all Features including trackBy, why is it not only for Arrays ?